Haryana SSC has declared TGT-English (Rest of Haryana) written test result on 03rd September 2016 on official website www.hssc.gov.in. The written test was organized on 07th February 2016 against advertisement 09/2015 category no. 1. The result has been announced and the roll numbers of qualified candidates called for interview / viva-vice has been uploaded on the result page of HSSC. The HSSC TGT interview callletter will be uploaded from 08th September 2016. The interview is scheduled from 14th to 16th September 2016. The reporting time for HSSC interview 2016 for TGT English has been set as 09:00 am / 12:00 noon at the venue of viva-vice. The interview venue is also mentioned in the interview call letter of HSSC. As it is well known to everyone that what is happening with Haryana newly JBT selected candidates by the courts. You are all given best wishes from us that everything would go better with you. The scorecard / marks secured by the candidates in the written test has been displayed in the bracket with their respective roll number. The marks obtained is displayed out of 160 marks. Haryana online marks list can also be downloaded from website www.hssc.gov.in. 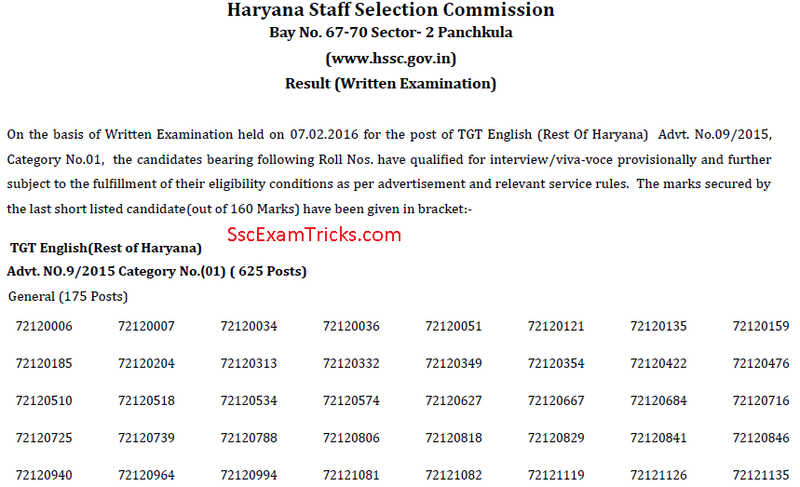 Earlier Haryana SSC had notified for recruitment of 625 posts of TGT English against Advt. No.09/2015, Category No.01. The selection would be made by written test followed by interview of the candidates. HSSC result for TGT English has been announced now and list of shortlisted candidates for interview has been uploaded by Haryana SSC. Don’t forget to do your HSSC login for further information / instructions provided by Haryana SSC. It’s time to check whether Haryana Staff Selection has provided interview schedule with instruction to the qualified candidates. It is the best time to download Haryana SSC Result for TGT English for the rest of Haryana. The HSSC has uploaded this result in the PDF file of 49kb size. The following steps can be used to download HSSC TGT Result 2016. 2. Click on ‘Result’ section provided at the top of the page. 3. The direct link will be appeared as ‘Result of Written Exam for TGT English ( Rest of Haryana)’ with download size. 4. Click on the download size button displayed and let your HSSC TGT Result be downloaded. 5. Open the PDF file and check your roll number.